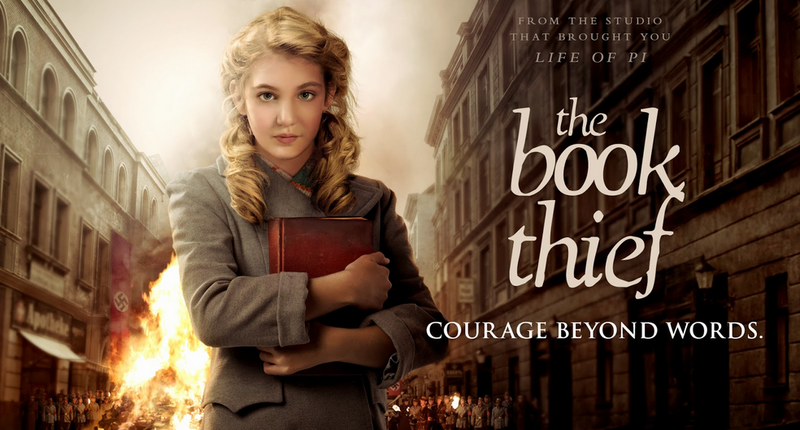 I hate to heap unfair expectation on a film in the lead up to eventually seeing it, but in the case of The Book Thief I was never going to be able to restrain myself. The 2006 novel, written by Australian author Markus Zusak, is without a doubt one of the best, most memorable and most emotionally enthralling books I have ever read, and I was both excited and apprehensive about whether a screen adaptation would be able to portray the extraordinary experience that the source material provides. Narrated by ‘Death’, the novel has been touted as one of those ‘unfilmable’ tales, but I was given some hope by the fact that The Book Thief was being transferred to the big screen by the same studio that did wonders with a similarly difficult adaptation, Life Of Pi. Would the film defy the odds and manage to capture the excellency of Zusak’s original work? The picture tells the story of Liesel Meminger, a young German girl who is given up by her communist mother in 1938 and adopted by a somewhat eccentric middle aged couple. Once settled in her new home, the stirrings of the Second World War creep ever closer and through a period of roughly eight years we see our protagonist’s budding love for reading and writing (and, of course, stealing) flourish, as well as young romance and the many struggles that take place during Germany’s darkest years, highlighted in the form of a Jewish man whom the family hide for several years in their basement. As mentioned above, one of the novel’s most unique aspects is the fact that it is narrated by an omnipotent incarnation of ‘Death’. This creates an extraordinarily eery feeling of foreboding on the page, but as a cinematic technique the film never quite feels comfortable with the voice, as using it infrequently loses its impact and some would be forgiven for forgetting the identity of the narrator all together. I have reservations with regards to the manner in which the plot has been adapted from prose to screen, as many changes have been made that do not help to solidify or clarify the story in any way, in fact only serving to dampen the impact of the tale in certain parts. Ironically, the scenes that remained faithful to the source material were the moments of the film that had the most emotional depth and authenticity, leading one to wonder why so much fiddling was done in the first place. For a story set so deep in the midst of the Nazi regime, the harsh truths and real horrors of the period are merely prodded at with a very long stick. With the exception of one rather upsetting scene depicting the infamous Kristallnacht of 1938, the war and the treatment of those groups whom Hitler deemed undesirable is depicted in a very distant manner, a feeling that is exclusive to the film as the novel explores both military warfare and the Holocaust to a much greater extent. The core cast of the film manage to maintain a decent level of performance without ever being particularly remarkable. Sophie Nélisse as Liesel grows in to the role as the picture progresses, but, though comfortably handling the dramatic demands of the more sombre moments, she never really captures the spark, determination and mischief of the character that I remember so well from written form. Geoffrey Rush as adoptive father Hans Hubermann is as warm and endearing as I had imagined the character to be, but the most praise must go to Emily Watson as matriarch Rosa Hubermann, perhaps the most complex personality in the novel and equally so on screen. Watson’s depiction and mixture of stoicism and ferocious love and affection is arguably the films most meaningful achievement, one of the few emotions evoked that feels authentic and resemblant of anything beneath mere surface shine. Watson also wins the award for most convincing non-native German accent, which sadly brings me to another inherent problem in The Book Thief. In what can only be deemed lazy filmmaking, as well as an array of suspect German accents, the film contains an utterly bizarre mixture of accented English speaking, subtitled German and the odd ‘und’ and ‘nein’ thrown in in an attempt to blend the two choices together. Admittedly there are many films that indulge in this indecisive speech choice to get around the English telling of a foreign story, but in this case it seemed to be particularly contrived and noticeable. Perhaps I am judging with a tainted mind, but I honestly do not know how coherent the film will be to viewers who have no additional knowledge of the plot from the novel. Significant detail is dismissed, which left me to fill a number of blanks myself, and unfortunately, what was a unique, deep, complex and utterly engrossing tale of wartime survival and growing up becomes nothing more than a period piece that fails to both fully connect with and develop its characters and insightfully display its era with any real passion or feeling. I did cry at times, not because of what I was witnessing on screen but because of my associated memories from reading Zusak’s incredible literature. 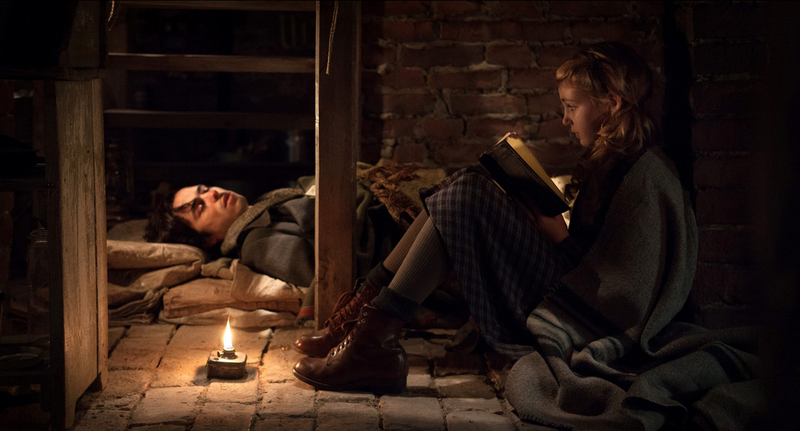 The Book Thief does have some moments of worth, but it is ultimately a weak and underdeveloped adaptation of a novel that is as far away from those adjective as it can possibly be. My advice? Choose imagination over visuality. Spend a few days reading the book and become lost in a story that is so unique and unforgettable that you will not feel the need to see a much more feeble portrayal in the cinema. Maybe because I haven’t read the source material, I liked the film more than you. Though I too think it has some flaws. I am seeing this tomorrow and like you I loved the book… its going to be an interesting comparison!